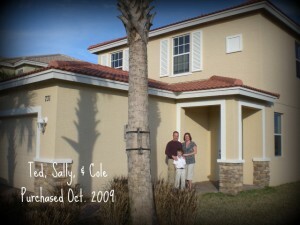 Sally and her son Cole came to visit in August of 2009 with two locations in mind – either St Lucie West or the Town of Tradition. Their family had decided they’d put their home on the market in Connecticut but felt that it would be best to secure a purchase in sunny South Florida while prices were very low. We toured quite a few communities while Sally was here and chatted about her applying for a job within the St Lucie County school system, as she was a teacher up north. Cole cracked me up because he was the biggest critic of the tour – claiming doors were creepily too high, dead bugs were unattractive, and generally carrying on about the condition of the vacant homes. He made for some great entertainment! Just for a quick trip I decided to show Sally the homes in Vizcaya Falls which is north of St Lucie West in an area that is known as Torino. We toured a few new homes that were left by the previous builder and then purchased by the developer Kolter, who will be re-establishing the community. These large, 2-story homes gave Sally the sense of space and room that she was used to in her big home back in Connecticut. After going home, we kept in touch regarding homes on the market and I even shot a few video tours of properties that Sally couldn’t see while she was away. The day came when the family decided that just maybe Vizcaya Falls had everything that they wanted so they decided to make an offer on a water front home below what the developer was asking. The listing agent scoffed and said they’d never take it but the good news came over the weekend that they’d settle on a price very close to what Sally and her family offered! Plane flights were booked and Sally came back to town by herself to tour the home during her inspection period. The closing went on without a hitch in October 2009. The family was all reunited in February and I finally got to meet Sally’s husband Ted to snap the photo above. I’m happy to report that Ted liked the house and they lived happily every after! Oh, and Sally got the job with the St Lucie County school system and is now one of our fine teachers here locally! Cheers to Sally, Ted, and Cole and their fabulous lake-view home in Vizcaya Falls! Read other success stories and be inspired.